The 2015 and 2016 racing seasons have proven to be eventful; the Manufacturer’s Cup, NHDRO and IDBL classes were filled to the point of overflow with street bikes and purpose-built racing machines alike. At a Man-Cup race, you are likely to find anything from the seven-second proven Kawasaki H2 Triple of William “Bill” Baxter (ridden by Alex Hughes) to “Tink-Tink” of Joey Gladstone and the DME team. Over the years, the KZ and GS platforms constantly handed off the baton between one-another; who was faster? As time went on, the KZ disappeared and the GS platform was the dominant four-cylinder in Pro Stock Motorcycle for quite a time. In 1999, the Hayabusa came out, and delivered a shock to the drag racing scene. With the release of the ZX-14 later on, we were back to old times; the well known Kawasaki vs. Suzuki rivalry. 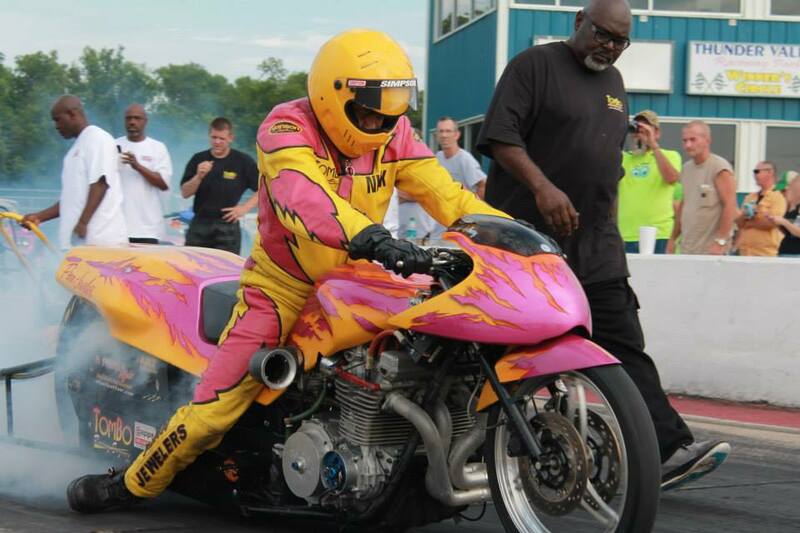 The Hayabusa has become the choice of dragbike racers. 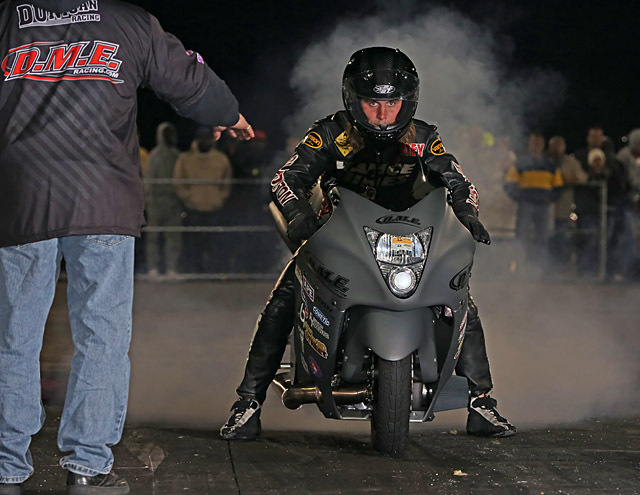 With advancements in engine technology, we may be to the point in dragbike racing history that the end is beginning to spell out for the KZ and GS platforms and their use in the funnybike classes. 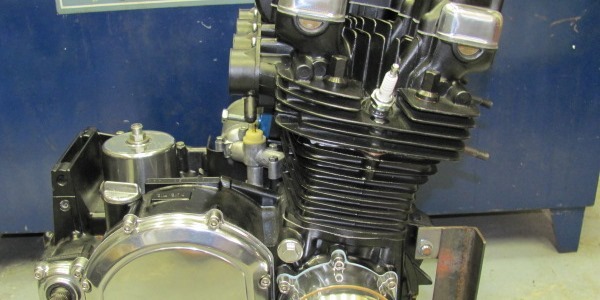 Jacob Green’s 1975 KZ is number 410 – an HTML code for gone. Think about this – the Kawasaki Z1 was designed more than 45 years ago. At the time, it was a revolutionary, record-shattering, and plain stupid-fast motorcycle. Parts for the KZ and even GS platforms are becoming more difficult to locate – but like anything else, the aftermarket is thriving on. Parts are also readily available for the Hayabusa, and the ZX-14 alike. However, time has told us that the ‘14 isn’t for you if you want to run well into the sixes. The iconic Kawasaki KZ motor. So many parts have come out for the first and second generation Hayabusa that it would make your head spin. The bikes are 9.90 capable all day long off of the showroom floor. With an extended swing arm, excellent rear tire, Dynojet Power Commander and a full exhaust system, consider yourself one amongst now several ‘Busa riders in the 8.90 index class. With minor modifications riders like Mark Dotson run low e.t.s on the Suzuki Hayabusa. As a five year old, I remember going to the 2002 PMRA season opener. My birthday was sometime the week of or week before the race – It was fourteen years ago, give me a break! I remember taking a walk through the staging lanes in the arms of my father and endlessly staring at all of the bikes that were strewn about the lanes. A few notable machines were those of Glen Nickelberry, Leroy Hill, Troy Brown, and Otis “Goonie” Kelley. The first funny bike I ever saw make a lap on the track was that of Nickelberry, who laid down a solid 7.02 @ 202 with the assistance of Tommy Bolton. 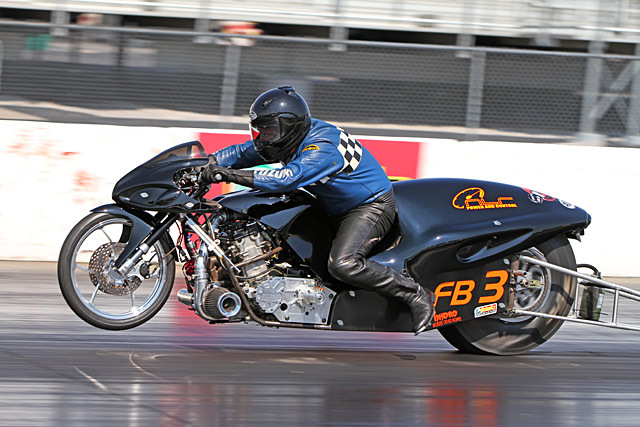 For the longest time, Nickelberry’s bike was the fastest blow-through turbocharged Kawasaki on the planet. Two years beforehand, on August 26, 2000, Leroy Hill set the speed record on the PMRA Circuit at an impressive 212.31 miles per hour. This record stood for sixteen years before it was broken by Chris Cutsinger on October 30, 2016 and reset to 212.93. Let’s take it up to 2014; the Manufacturer’s Cup world finals at South Georgia Motorsports Park in Cecil, Georgia. 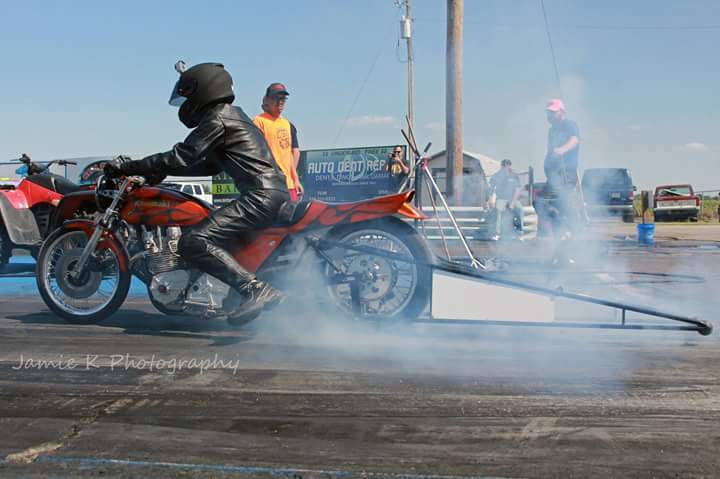 Throughout the weekend, Joey Gladstone and the bike we all know as “Tink Tink” treated the world to a string of 6.70 or lower ETs, tied, and then reset his own record twice for a street platform motorcycle. 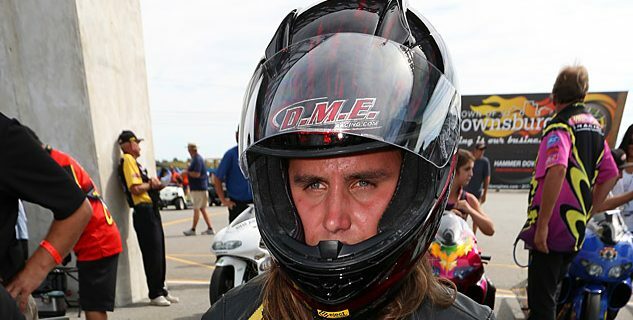 In the second round of eliminations, Joey wrote his name down as the fastest man on a street bike in the world – after laying down a 6.551 @ 227.50. This speed record still stands to-date; 227.50 miles per hour in 1,320 feet on a motorcycle fueled by anything other than nitromethane. When the time came for the final round of eliminations in Pro Open, Joey faced a tough competitor who had been running consistent 6.60s all weekend. Mark “Mr. Paint” Rendeluk made the haul from Oklahoma City, Oklahoma to see what his bike was truly capable of. Crew chief Chris Wedman made a few adjustments to the bike to squeeze a few extra ponies out of the near 1.8 liter GS based monster nestled in the frame rails. Rendeluk and Gladstone rocket down the track – Mark getting away first at the tree. It seemed for the front half of the track that the race was in Rendeluk’s favor. He had covered Joey by over a tenth at the 60 foot mark, and two tenths at the 330. At the eighth mile mark, the two were separated by 0.158 seconds – Mark was still out by several bike lengths. Joey started making a comeback; he had a 10 mile-per-hour advantage at the half track. At the stripe, Joey had set the record for fastest elapsed time on a no-bar bike – running a stellar 6.509 @ 225.03 over Rendeluk’s 6.557 @ 196.85. Gladstone also managed a 2.201 second back half, and overcame an outrageous deficit of 0.220 seconds. Now let’s skip a year forward, the Manufacturer’s Cup 2015 world finals. Yet again, it was Rendeluk and Gladstone in the final round of Pro Open, but there is a twist this time around. Rendeluk yet again got away first, but the tire went into a spin and the motor expired. It was all Gladstone and Tink Tink to the finish line – laying down an even quicker 6.469 @ 220.26. Gladstone and the DME team have set the bar very high for the no-bar boys; this one will be hard to touch. Another notable Hayabusa performance of 2015 would be that of Vincent Testa. 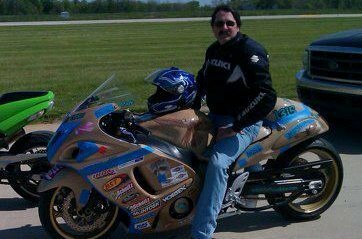 Testa owns a turbo Hayabusa powered car tire bike that has made appearances on the Manufacturer’s cup and PMRA circuits. Vince struggled with the bike throughout the weekend of the 2015 PMRA World Finals – he could not manage to keep the bike in a straight line until the second round of qualifying. It was then that he laid down a 6.452 @ 209.72, and with that pass, he reset Brian Lewis’ elapsed time record of 6.51 @ 203.80. It was proven with the .45 pass that Vince has a very capable machine that could reach well into the 6.30 range, given that the setup is right. Vince said that he has some plans for the winter time that will step his program up, but I’m not going to give any Testa speed secrets away. Now on to 2016, yet again, the Manufacturer’s cup world finals. This time, Rendeluk wins it with a very consistent performance all weekend long – It’s his opponent that changed in the final. Mr. Paint faced Jean Gosselin (who had driven from the Canadian province of Quebec), and Mark didn’t fail to come up with the redemption. 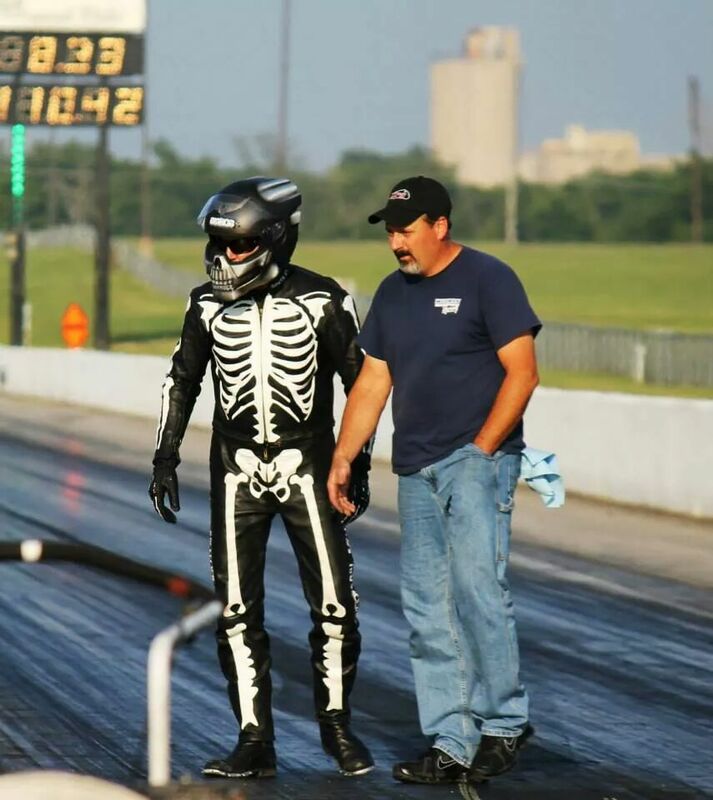 Mark Rendeluk and his crewman Chris walk the dragstrip. 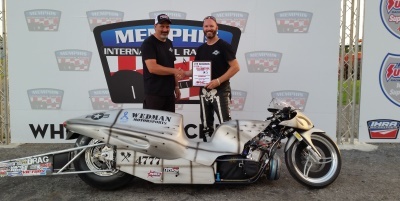 Rendeluk strapped a stellar .004 reaction time on Gosselin, and his machine laid down a 6.601 @ 197.91. Myself and the PMRA guys have just settled on it; Mark has a 6.60 bracket bike, and consistency works in his favor. Rendeluk was .040 or better on the tree all day long, and his reaction time in the finals was his best on the day. Rendeluk channeled back to his super comp days; Double-Os and win lights! Also in pro open – off of the trailer (first lap of the weekend), Chris Cutsinger laid down a 6.42 @ 212, moving Vince Testa’s record to the number two spot. Cutsinger adjusted his tune, and returned to the lanes for another lap that would change the funny bike scene, and re-write the funny bike record books. 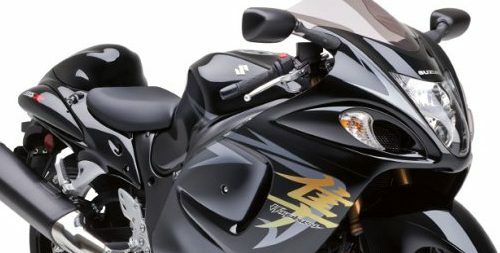 Like any other Hayabusa, Cutsinger and his machine were off with a sluggish 1.101 60-foot time – sluggish, yet so deceptive to any seasoned opponent. The turbocharger worked its magic and carried Chris through the eighth mile traps at an acceptable 4.142 @ 182.08, some near pro mod numbers. Cutsinger rocketed to a 5.32 1000-foot time; clicked the 1320 beam in 6.348 seconds, and achieved a maximum speed of 219.33 miles per hour. This reset the funnybike world record, and Chris’ machine would claim the title of world’s quickest Hayabusa. However, the funnybike record that Chris set only stood for five minutes. Travis Davis lowered the record by only one one-thousandth of a second to 6.347. 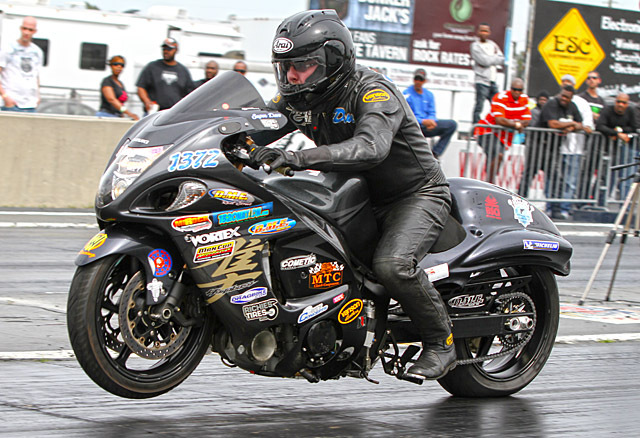 With these performances – we can say that the Hayabusa platform is shaking things up in the funnybike world. Rumors are running about and many thoughts are racing through heads; “how can we make this thing faster?” With time, study, and hard work, it’s possible we could see a competitive set of Hayabusa dragbikes next season. Just one question remains – can we get one into the fives? Let’s see what 2017 brings for the Hayabusa guys. Here’s to another fantastic season. Big thanks to Jacob Green for the submission. 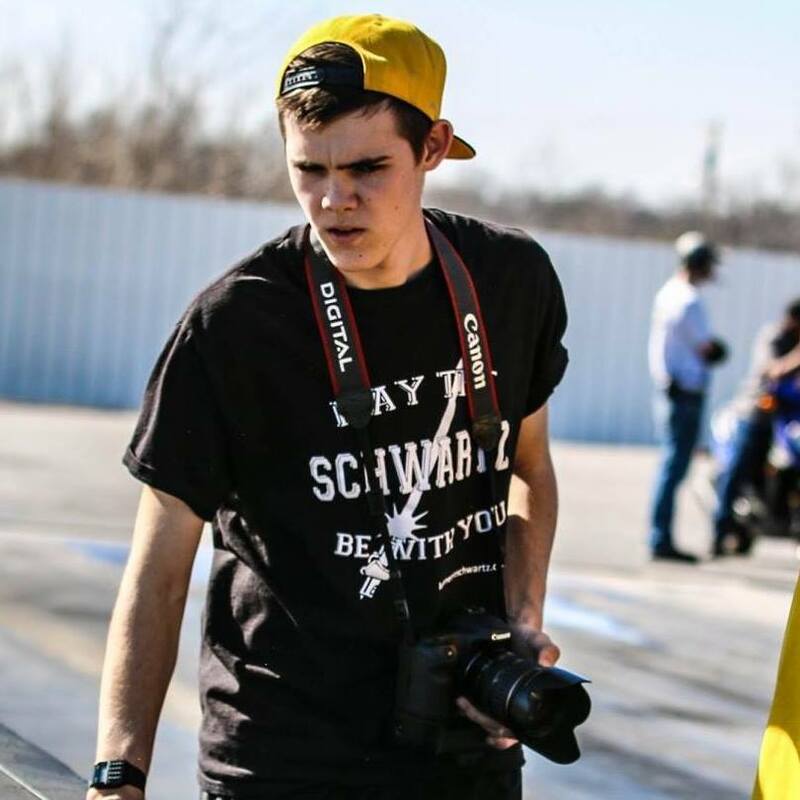 Motorcycle drag racer, journalist and photographer Jacob Green.